Here are a series of photos we co-created with Leah Marie's expert modelling and photography experience to show off a variety of special lighting effects created by our Laser Starfield Projectors including the BlissLights Bliss 15, more complex Bliss 50, a Red/Green Starry Starry Night combined with DancingWings.com for catching the lighting so vividly. 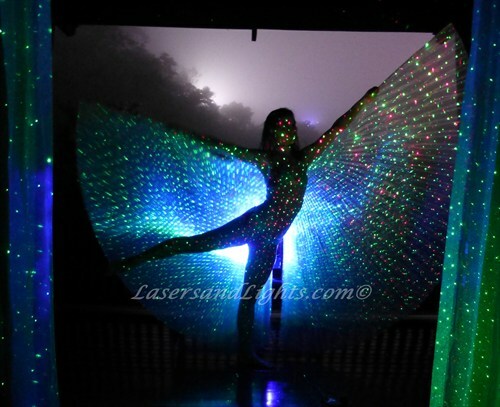 We placed the Bliss 50 behind the model and the BlissLights Bliss 15 and Red/Green Starry Starry Night in front so you see the back lighting and the lasers on the www.DancingWings.com in front. By placing the more complex Bliss 50 behind the model and the BlissLights Bliss 15 and Red/Green Starry Starry Night in front of the model you see the back lighting and the lasers on the DancingWings.com catching the lighting details. With the Bliss 50 behind the curtain and the BlissLights Bliss 15 and Red/Green Starry Starry Night in front of the curtain you see the shadow effect like a shadow dancer. By placing the model in front of the curtain and the BlissLights Bliss 15 and Red/Green Starry Starry Night in front of the model you see the back lighting and the lasers on the model and curtain in front. By placing the more complex Bliss 50 behind the model and the BlissLights Bliss 15 and Red/Green Starry Starry Night in front of the model you see the back lighting and the lasers on the DancingWings.com in front. Special thanks to Leah Marie of www.sharehousephotography.com for co-creating this photo session and modeling in this series.